Greetings again from the darkness. Life’s eternal mysteries include the question, how can one be a father when not yet a man? 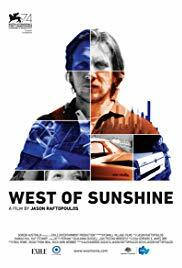 The feature film debut of writer-director Jason Raftopoulos focuses on fatherhood and the price of self-destructive behavior, while finally gathering the strength to right one’s self. Damien Hill stars as Jim, a blue collar courier with a gambling habit that likely cost him his marriage, his previous job, and a solid relationship with his son. Jim is basically a decent guy who can’t seem to overcome his weaknesses, which leaves us judging him as a hapless dude who can’t buy a clue. The story unfolds over a single day as Jim faces a deadline from the loan shark he owes thousands. Banos (Tony Nikolakopoulos) is a scary looking guy who, in loan shark circles, would be considered relatively patient … although he has reached the breaking point with Jim. Of course, Jim has a stellar plan to pay back the money – a “sure thing” on a horse in today’s race #2. However, there’s a blip (at least one) in his plan. His estranged wife reminds him that today is his day to look after their son Alex (Ty Perham, real life stepson to Mr. Hill). So father and son, rocky relationship and all, take off on a road trip around Melbourne as Jim proves to be one of the city’s worst couriers, and a borderline incompetent father. When Jim’s horse does in fact pay off, he makes the all-too-familiar mistake of a gambling addict … rather than pay off the debt, he tries to win more. You can surely guess how that goes. Desperate times call for desperate measures, and the father-son team go about tracking down Jim’s old contacts in hopes one might help him through this dilemma. It should be noted that Jim and Alex are traveling in style – Jim’s classic Ford Fairlane, with quite an impactful story of its own. Support work is provided by Arthur Angel (as Jim’s friend and co-worker), Kat Stewart (a former girlfriend who runs an illicit business out of her bakery), Fay Smythe (Jim’s wife), and Eliza D’Souza (a would-be girlfriend and yet another Jim lets down). Being a role model for a kid is not easy for someone as self-destructive as Jim. The steady stream of “I promise” and “I’m sorry” make it clear where Jim’s priorities rest. Alex wants to look up to Jim, but spends more time looking down on him. It takes a near catastrophe for Jim to wake up … a wake up that only occurs when one grows weary of always racing against the clock. Leaving the past behind – both emotionally and with a symbolic sacrifice – is Jim’s only path to redemption. Fine, naturalistic performances make these characters relatable to us, and filmmaker Raftopoulos does a nice job with keeping the pace moving along, while never losing that sense of reality.